The Conquest Classic collection offers high-quality Swiss watchmaking technology and a great price-performance ratio. Top models in this sporty-elegant collection feature column wheel chronograph movements. The Conquest Classic collection has been part of Longines' portfolio since 2013. However, the collection's roots go back to 1954, when the Saint-Imier-based watch manufacturer introduced the first generation of the Conquest. With a diameter of 35 mm and a gold case, these watches were an iconic product of their time. The modern Conquest Classics have a sportier design and a larger, 42-mm case. The watches have a timeless, elegant look that suits every situation and every outfit. Highlights in this series have a column wheel chronograph movement or a chronograph movement with an annual calendar and a moon phase display. For lovers of simple timepieces, there are three-hand models with a date display. Diamond-set women's models are also available. Every model in this series is fantastic value for your money. 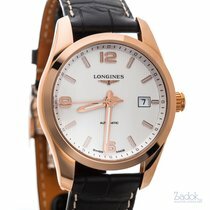 The mechanical watches in the Longines Conquest Classic collection are available at comparatively affordable prices. Even new, these intricate chronographs with a moon phase display and annual calendar are available for 2,300 euros. For comparison, a new Patek Philippe Annual Calendar Chronograph costs at least 35,000 euros. 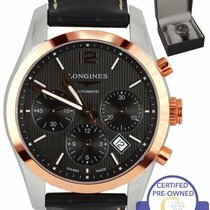 Longines' column wheel chronograph is a very affordable alternative to many other Swiss chronographs. You should be prepared to spend about 1,500 euros on a used timepiece and 2,000 euros for a new one. A new 18-karat rose gold version costs 7,000 euros. The stainless steel model is comparable to the 2017 Autavia from TAG Heuer, a retro chronograph. You can purchase it for about 3,500 euros. If you don't need any additional functions and prefer simple designs, then the three-hand watches in the Conquest Classic series are a perfect fit. Since the entire collection is still new, there are few pre-owned watches available. You can purchase new timepieces with the automatic caliber L619 (based on the ETA 2891/A2) and a date display for around 1,300 euros. Prices for bicolor models with an 18-karat rose gold bezel start at 2,000 euros, while prices for the rose gold versions are around 5,000 euros. If you want to gift your sweetheart a diamond watch, you should plan on spending around 3,000 euros. The timepiece with reference number L2.285.0.87.6 features 42 diamonds set in the bezel and mother-of-pearl dial. Highlights in the Longines Conquest Classic collection are the automatic column wheel chronographs. Compared to a shuttle chronograph, a column wheel chronograph is considered more prestigious and of higher quality. It also has push-pieces which function incredibly smoothly. The famous caliber Valjoux 7750 is a shuttle chronograph movement. ETA produces the caliber L688 used in the Conquest Classic exclusively for Longines. If you turn the timepiece over, you can view the decorative movement through the sapphire glass case back. The watch design is sporty-elegant: The polished bezel and case give the watch a stylish look, while the metal bracelet lends it a sporty touch. If you prefer a more classic watch, then you can choose an alligator leather strap. The strap goes very well with 18-karat rose gold models. Bicolor stainless steel and rose gold models, on the other hand, have a matching bicolor metal bracelet. The dial is available in silver or black. The manufacturer mainly uses luminous indices for hour markers, but a single Arabic numeral is visible at 12 o'clock. The counter and small seconds subdials are in a tricompax layout. The small seconds is at nine o'clock, the 30-minute counter is at three o'clock, and the 12-hour counter is at six o'clock. The date display window is located between four and five o'clock. The power reserve lasts an impressive 54 hours when the movement is fully wound. 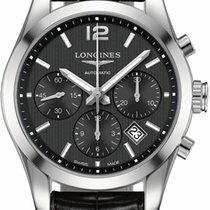 You can purchase a new Longines column wheel chronograph from the Conquest Classic collection starting at 2,000 euros. Alternatively, you could choose a model from the HydroConquest series. These diving watches are waterproof to 300 m (30 bar) and are also powered by the L688 column wheel chronograph movement. You can purchase new models for around 1,300 euros. The chronographs with an annual calendar and moon phase display are the mechanical highlights of the Conquest Classic series. The automatic caliber L678 (based on the Valjoux 7751) powers these intricate timepieces. The movement has a 48-hour power reserve and can also be found in some models in the Master Collection. The date is displayed via a long hand with a half moon at its tip. The current day and date are displayed on the 30-minute counter at 12 o'clock. The 12-hour counter is located on the lower half of the dial at six o'clock and also features a moon phase display, and the small seconds and 24-hour display are located at nine o'clock. This Conquest Classic model is available with a stainless steel, rose gold, or bicolor rose gold and stainless steel case. You have the choice between a blue, silver, dark red, or black dial and a leather strap or metal bracelet.